When I was diagnosed with skin cancer earlier this year I was devastated and fearful of the future. Thankfully, it was treatable and my fears were then transferred to protecting my own children from the harmful effects of too much sun. We live in Florida and only one major sun burn increases their risk of developing skin cancer in the future. Unfortunately, my daughter also has skin that is easily irritated due to eczema so it is particularly important to use a natural sunscreen that is effective. I discovered Goddess Garden which has a line of 82% organic mineral sunscreen specifically developed for children’s sensitive skin including babies, bigger kids and the entire family. As a mom, I highly value having an effective product line like Goddess Garden that will protect my children’s skin without all of the chemicals added into many traditional sunscreen lines. Goddess Garden is proud to be ranked “Best Natural and Organic Sunscreen” as featured by Environmental Working Group’s 2011 Best Beach & Sport Sunscreens and Yahoo! Shine’s Safe Sunscreen List! 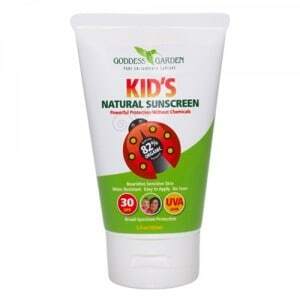 The Kid’s Natural Sunscreen 30 SPF provides broad-spectrum protection with zinc oxide and titanium oxide. I really like that this lightly-scented sunscreen applies easily to the skin and absorbs almost instantly with no white residue. My daughter’s skin did not have any irritation and in fact, it actually seemed to have moisturizing properties especially in her eczema prone areas. Perhaps this is attributed to the impressive addition of high quality ingredients such as Aloe Vera Juice, Organic Soybean Oil, Sunflower Seed Oil, Organic Shea Butter and Organic Lavender Essential Oil and Green Tea Extract. Normally, my children complain when I insist on lathering on sunscreen any time they are headed outside but they actually like the Goddess Garden sunscreen line and there were no protests at all when I called them over to reapply it since it is tear-free. This water resistant product was surprisingly long lasting and I normally have to reapply any natural sunscreen every 20-30 minutes when my children are in the water on a blazing hot, Florida day. I found myself only needing to reapply Goddess Garden Kid’s Natural Sunscreen once per hour or even less frequently on a cloudier day or later in the afternoon when the sun is not at its peak. Green Goddess is proud of the newest product in their line, the Kid’s Spray Natural Sunscreen and it is my family’s favorite. I love how easy it is to spray the sunscreen exactly where I want it and then rub it in and watch it vanish into the skin. The pump action is super easy to use and I highly recommend trying this product from Goddess Garden…..it is just wonderful. It is important to protect baby’s tender skin too and the Baby Natural Sunscreen is 74% organic and contains all of the beneficial features of the Kid’s Natural Sunscreen such as being water resistant, easy to apply and tear-free but is also scent-free. It protects using Zinc Oxide and also contains jojoba oil and vitamin E. I was pleased to see that Vitamin E is in this product because my specialist informed me this particular vitamin is extremely valuable in protecting the skin from the sun (I take a supplement every day). My children really like the Goddess Garden UV Bracelets that comes with fun and “magical” lady bugs that turn a deep magenta color in the sun. It is a great way to teach them about the sun’s invisible rays and it reinforces the need to apply (and reapply) sunscreen. 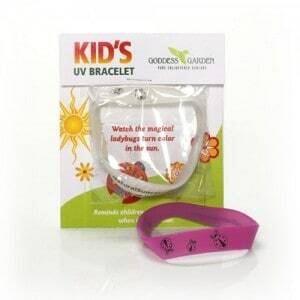 Plus….these UV bracelets are fashionable and they love to show it off to their friends. I also like to keep several Travel Size packages of Kid’s Natural Sunscreen in my bag so that I am never caught by surprise without access to sunscreen…..what a great product idea and this way I don’t have to keep a bottle of sunscreen in my car. If you can imagine, I once actually had a bottle of sun block burst open in my car on a very hot day and it was quite a mess to clean up! Overall, I am very pleased with the quality and performance of Goddess Garden sun care products for children and families. It is reassuring to know that there are quality sun care products available for children that are affordable and effective without all of the potentially harmful chemicals. You are invited to visit the Goddess Garden website to learn more or to purchase any of the products in this line. You can connect with Goddess Garden on Facebook and Twitter too!